I have to confess I had never heard that along with the well-known kamikaze suicide air pilots, the Japanese military had also employed suicide divers, human land mines, suicide boats, and manned torpedoes as they desperately tried to reverse their worsening fortunes in the last months of World War II. 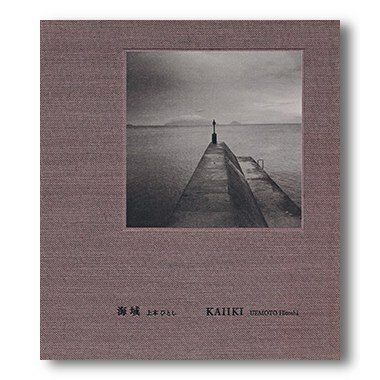 It is the manned torpedo program that forms the backdrop for Hiroshi Uemoto’s poignant Kaiiki, although its poignancy is a subtle one not readily apparent upon first view. This isn’t a historical or documentarian look at Imperial Japan’s suicide mission program or the soldiers tasked with carrying out their tragic missions, but rather a book of landscapes, or more precisely seascapes. 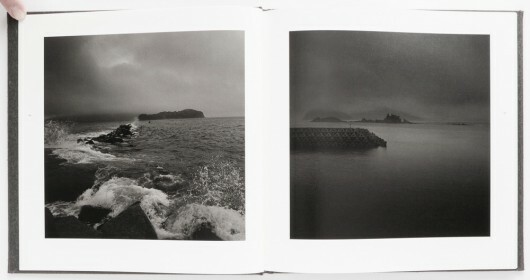 Nor is the sea Uemoto photographs — specifically the Seto Inland Sea, where the Imperial Navy maintained three training sites for their manned torpedo program — a rough, violent one that could help illustrate such an emotionally fraught act as sacrificing your life for a stipulated greater good. 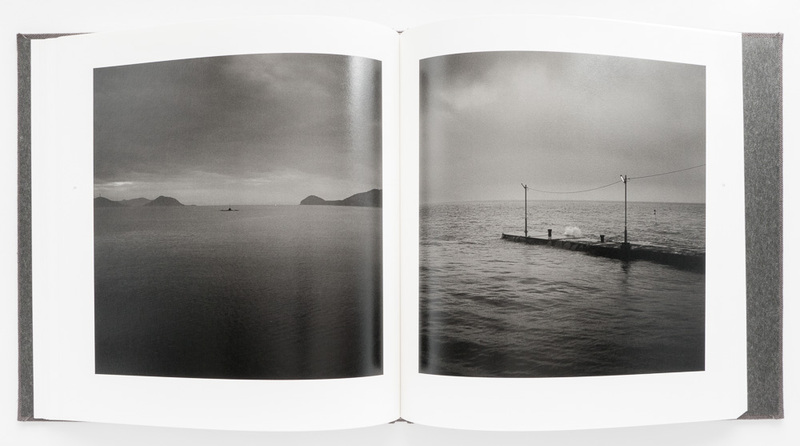 The sea we’re presented with is a disturbingly calm one, where the trail of a speeding fishing boat is the most violent thing that can be seen. Although as mentioned there is a lot of variety in how Uemoto presents the Sea, there is also in the editing of the book a deliberate repeating of certain vistas, scenes shot perhaps at slightly different angles, or with slightly different foreground or background elements, where we can’t be certain whether they are of the same place or not. This has the effect — like that of the square — of keeping us mentally boxed in. Not in a negative or aggressive way, but to say, let’s stay here for a while, perhaps there’s more here than meets the eye, perhaps these views have stories to tell us if only we can have the patience to look, and listen. 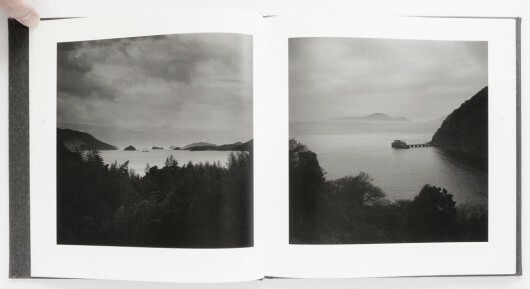 The photos are almost all dark and moody, some almost impenetrably so, and many feature heavy cloud cover or foggy haze. Many may have been shot at night, although this isn’t obvious. 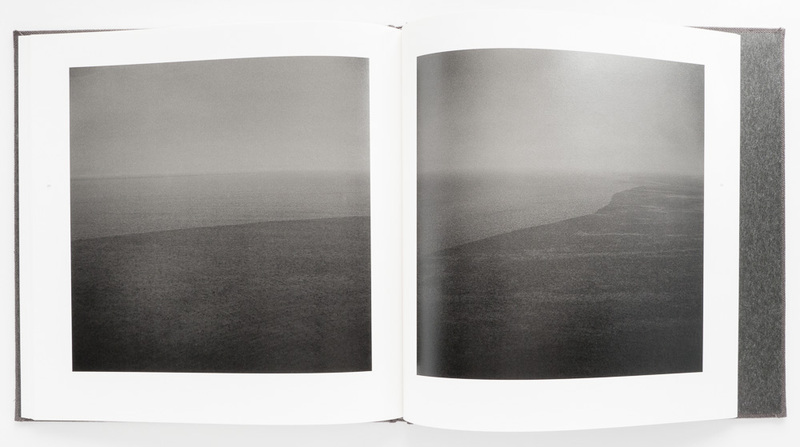 In lesser hands this darkness could easily push the viewer to frustration rather than wonder. (The publisher Sokyusha deserves kudos for the masterful printing of what couldn’t have been easy material to work with.) But here this darkness also draws us inward, compelling us to look further, make sure we haven’t missed anything, playing upon our natural inclination to suspect there must be things lurking in the shadows. There is such an obviousness to the latter statement, and yet reading this I was taken aback a bit. Of course, but for minor details here and there, the sea we gaze upon through Uemoto’s lens is the same one these young men looked upon. It is the constant and steadfastly innocent party to that which man has chosen to do with what it wants to. […]I recall feeling pathetic for having come of age during Japan’s economic growth spurt (that is, an era of materialism and greed) and I departed the island as if to flee from it. Now, approaching my sixtieth year, I am finally visiting this island again, feeling that I may now be able to direct my camera at it. One can only wish more young photographers would flee from their chosen subjects in such a manner, for the intervening years and maturity have helped Uemoto produce a measured and reflective work of subtlety and craft that, much like the usually placid water surface Uemoto has captured, invites us deeper, but doesn’t submerge us. Kaiiki is available in the Japan Exposures book shop.